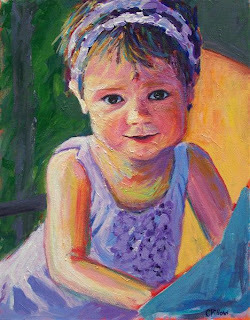 Another painting of my niece, Jaala. Jessica has some great pictures of her "modeling" the things she makes, and I can't help but want to paint them! (Check out her blog Happy Together for some CUTE CUTE things- she is fabulously creative!). I'm submitting this one for a juried show, "Small Treasures", by the Cary Gallery of Artists. I will know in a couple of weeks if it gets accepted. What a beautiful little girl. You are gifted at capturing a likeness, I believe. This is such a charming painting.